We have all seen marching bands at football games or in parades, and in the rear of the line are the big round bells of the tubas. Well actually, they usually are not tubas, but rather Sousaphones which are a different instrument altogether. 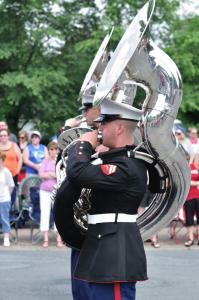 Sousaphones are specifically designed to be easier to carry and play while marching or standing. This all began with John Phillip Sousa, the American bandleader and composer who lived around the turn of the 20th Century. He was most well-known for writing marches like The Stars and Stripes Forever, but like many composers of that time, he was also an inventor of instruments, and in his role as director of US Marine Band, he created the Sousaphone. The Sousaphone combined a design that was easier to carry and a bell that was pointed towards the front of the band so the sound would project forward. He did this because a regular tuba is almost impossible to carry while playing, although has better intonation and sound quality. As with the world of music, it is not so hard in banking to mix up objects that do the same general thing but in reality are quite different by design (and that should therefore have completely different outcomes). Many banks are finding with their deposit products that differences may exist in design but are getting muddled and confused in their execution. The result can be a high cost of funds in what should be low cost core deposit products. One example is those products designed by outside vendors like rewards checking programs that automatically inflate the rate paid on transaction accounts to something near a 5Y CD rate. Those cases are obvious. The difference is less clear in most banks where deposit costs throughout a bank may rise over time, usually as a result of rate creep that begins in certain account types and then works its way throughout the bank's product set. In the current environment, there is a wide diversity of rates paid on different deposit products. Further, within every deposit category (including specials) there are a wide range of rates. For example, interest checking currently has a rate range of 24bps, from 1 to 25bps. When one considers the purpose of this product, this is a very wide range indeed. In another example, the current market for 12 month CDs has a rate range of 104bps, from 1 to 105bps. Where the purpose of these accounts gets muddled is when we realize that the top regular interest checking rate (25bps) is actually the same as the market median rate for 12 month CDs. This begs the question as to whether a high-rate checking account is really a checking account, or is it functionally a liquid CD? The same can be said for the top MMDA rates, which are frequently priced higher than CDs. How does a bank benefit by offering liquid products at CD rates? Are deposit customers requiring these rates combined with that level of liquidity to keep their business in the bank? The trend is more disturbing when you consider that today's deposit rates are compressed by historical standards. What will happen if and when deposit rates return to more "normal" levels and the differential between properly priced checking accounts and 12 month CDs increases to perhaps 300-400bps? Here, some banks' products are going to be more "sticky" and less rate-affected, while the same products for other banks will be much more volatile and expensive. So, why are some banks pricing their deposits in a way that encourages volatility and rate sensitivity? Some may posit that it is due to asset/liability management issues, interest rate risk, liquidity management, or competitive environments. We have found it most often comes from internal culture, or simply doing business the way the bank always has. Having superior funding performance is difficult and requires effort, as it is both an art and a science. It is critical to acknowledge that art and science can drive design in different directions when it comes to deposit pricing. So, now that our readers understand the difference between the design of a Sousaphone and a tuba, we wonder who can tell us the difference between a trumpet and a cornet? Treasury yields rose 8 to 9bps as retail sales rose but manufacturing numbers were weak. The Fed begins a two day meeting and the market awaits a Thursday decision on rates. Goldman Sachs predicts the Fed will wait until Dec to raise rates. Community bankers should note that Digital Trends reports Google has indicated Bank of America, Regions and PNC will offer Android Pay to their customers as it begins to roll out in the coming weeks. Twitter has joined forces with payments company Stripe in order to allow users of its platform to press a buy button to purchase products and services. Twitter has been testing this since 2014 and just announced the full launch. Of note, Stripe is also the payments power behind Pinterest and Apple Pay. Reuters reports Deutsche Bank, Germany's largest bank, is considering cutting 23,000 jobs or about 25% of its workforce. Gartner predicts that mobile commerce revenue will surge to 50% of US digital revenue in the next 2Ys. Meanwhile, Forrester projects mobile payments in the US will soar to $142B in the next 4Ys vs. about $50B at the end of 2014. The CFPB has fined the two largest buyers of debt in the country (Encore Capital Group & Portfolio Recovery Associates) $79mm. The CFPB has ordered the two to stop reselling and collecting on debts they cannot verify, will require changes to their business practices and will require them to pay refunds to consumers. As bankers get more comfortable with using drones to monitor construction loan progress, more indicate they are also beginning to see farmers use them to monitor crops, analyze data, identify insect problems, assess crop yields and deal more quickly with disease outbreaks.